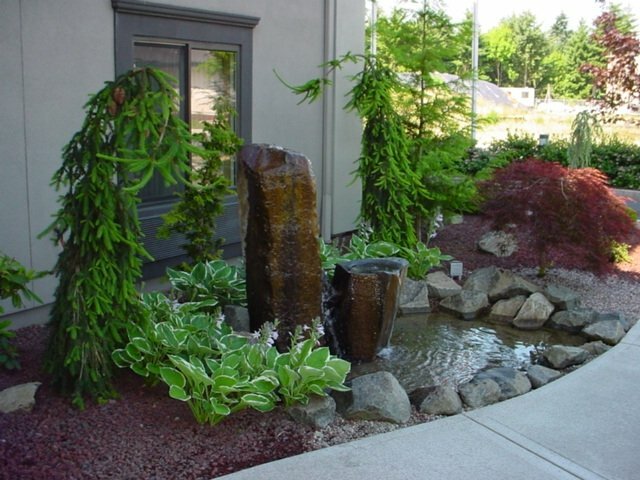 Here are some more great ideas in frontyard landscaping 2. 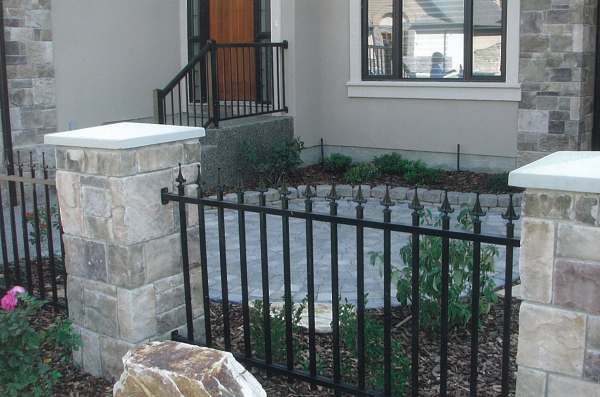 If you are looking for frontyard landscaping ideas, you've come to the right place. Dream Yard will be adding hundreds of pictures to our galleries over the coming months in 2015. If you want to know what we have here at Dream Yard for you, the best way to find out is to click on our site map. 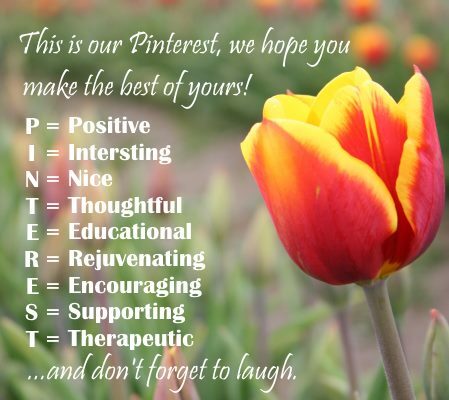 We also have nearly 17,000 pictures in our Pinterest account with nearly 200,000 followers that love our pins. We have categorized our pictures on over 80 different boards including one specifically on frontyard landscaping pictures. You can click on the follow us button for Pinterest to check us out. Dream Yard has lots of valuable information from how-to modules to articles about landscape planning and designing. 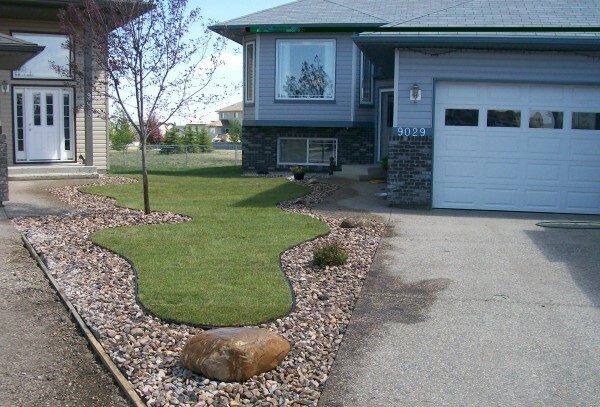 Hopefully you find some great frontyard landscaping ideas to give curb appeal to your own dream yard. 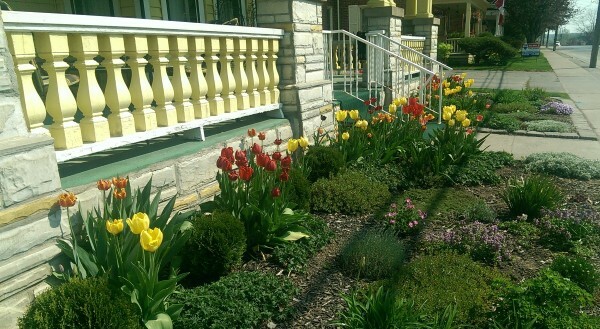 A no mow front yard using mulch, groundcovers, tulips and some assorted perennials to dress up an older home with a brightly painted front porch. 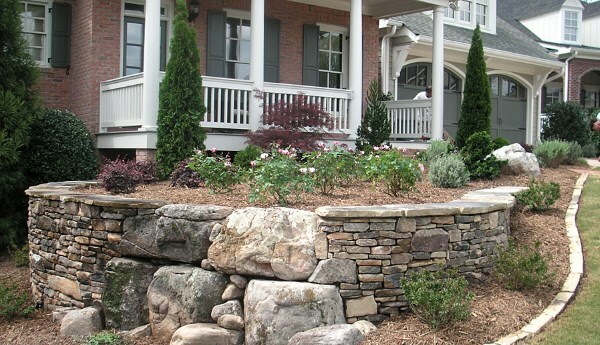 Add interest to a front yard by creating multiple levels with a stone wall. This dry-stacked stone wall was built with local ironstone. The wall was a 3 year project with every stone hand picked. 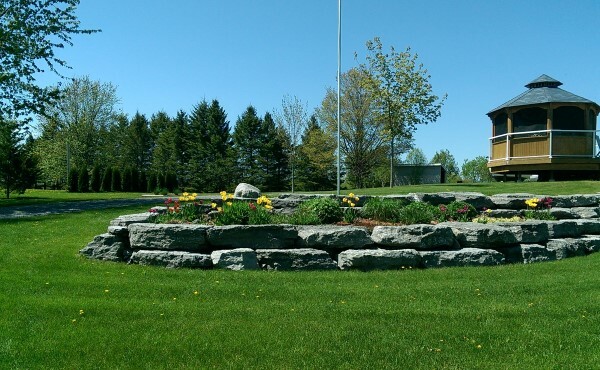 This front yard added a dry stacked low fieldstone decorative wall that fits right in the country setting it's in. This rustic looking front yard for a cozy little bed and breakfast includes a nice stone bench. 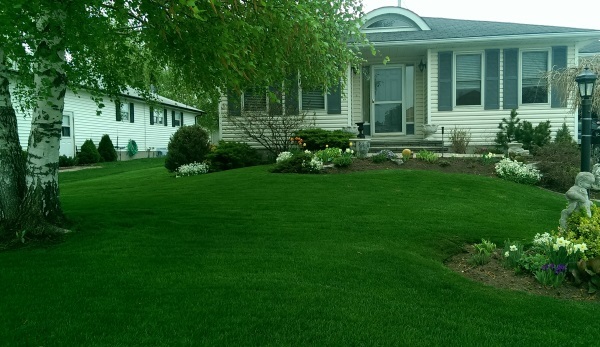 A large birch tree overshadows a lovely little front yard with some informal garden beds with nice flowing curves around a well manicured lawn. A bubbler welcomes people to this home along this front walkway. 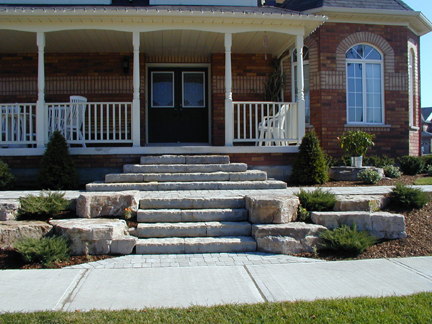 Beautiful stone steps split this low maintenance front yard as they lead to the lead to the front door of this home. 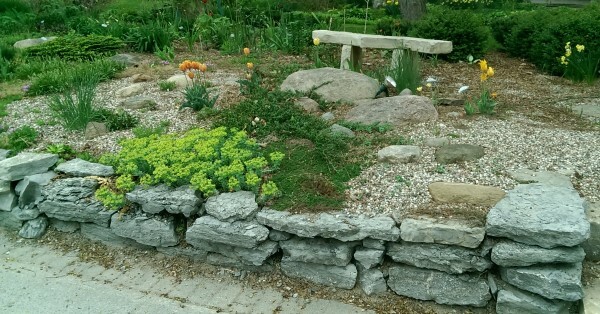 This beautiful front yard retaining wall of mixed stones makes a nice level area for a perennial bed. A small brick courtyard enclosed with stone pillars and wrought iron fencing gives a formal look. rather than divides the properties. This large block limestone wall makes for a great raised garden bed to welcome visitors to this large property. 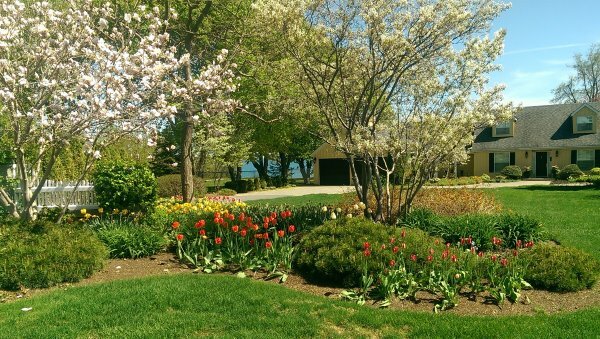 This front yard garden bed on a lakefront property is coming alive in the spring with blossoms and tulips. A nice flagstone front entry was added to this property to break up the large front lawn and add some curb appeal. A water fountain in the middle of the brick entryway is a nice touch to this home. 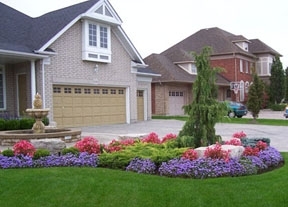 The garden bed in front adds colour and contour to the front yard. cozy welcome feel to the entrance.